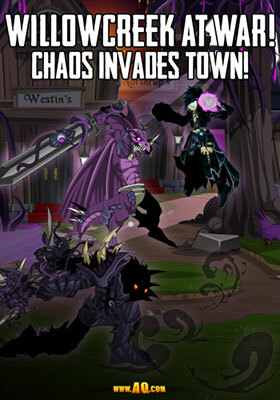 The Final Chaos War Event in AQWorlds! It is all out war! Want to be part of history as it happens-- live? 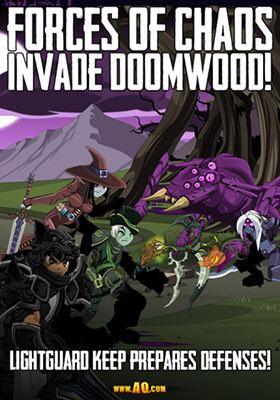 Unsheath your sword, grab your spell book, and join the most important battles in AdventureQuest Worlds. The forces of Chaos and the Alliance are clashing head to head in a live, real-time war. Victory or loss will determine the future of the storyline... towns may be destoryed, major characters may *gulps*, and well... in AdventureQuest Worlds, anything can and will happen! Read below to see what already has! 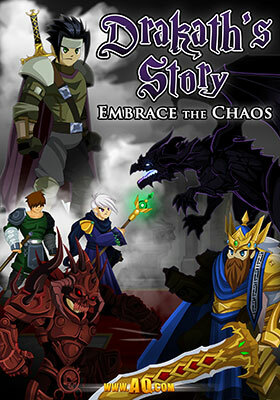 For years, you've battled Drakath, the Champion of Chaos. This weekend, learn the rest of his story: what turned him from a young Prince into an all-powerful mage bent on achieving a single, world-shattering goal! 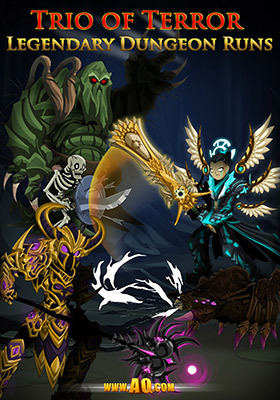 Play as Cysero, Artix, Warlic, or Robina the Hood AND Drakath as you finish the journey towards one of the most important events in our world's history: the day Drakath became the Champion of Chaos! Chaos forces poured into the small town of Willow Creek without warning. Unable to hold out for reinforcements, the town was overrun, burned, and destroyed. As the 13th Lord of Chaos lead his troops on to attack the next location, a chaos infused werewolf was left in their wake. Lightguard Keep *WAS* the last standing pillar of hope in the cursed, undead-filled forest of DoomWood. 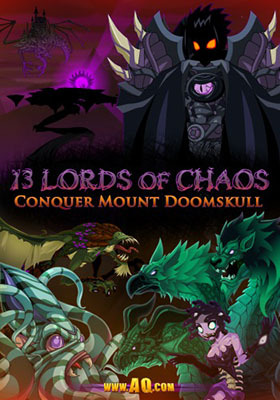 The alliance forces were unable to hold back the 13th Lord of Chaos' army. The forest is burning as you read this. There is still hope... a single battle does not determine the outcome of a war. Safiria is Queen of the Vampires, and a trusted ally who has maintained peace in her Kingdom with the Werewolves (Lycans.) 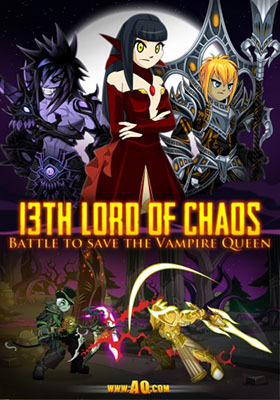 The war became personal when the 13th Lord of Chaos laid seige to her Kingdom in Darkovia. Despite a massive force of defenders, the Chaos invaders reached the castle of Safiria, the Vampire Queen. The most gut wrenching defeat in this war thus far... Queen Safiria was slain, and 10 million of her vampire minions disintigrated along with her. Angered and vengeful over this tragedy... the alliance forces will have no mercy in the next battle. 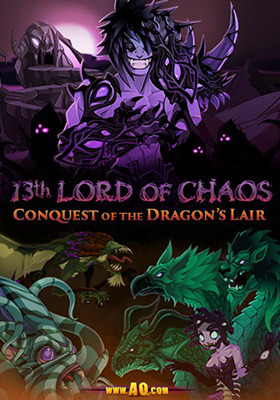 The 13th Chaos Lord is sending their forces to attack the Dragon's Lair while the Alliance works to recruit one of Lore's most powerful mages to their side - Xan the Pyromancer! Once inside the heart of the Lair, the secret of the 13th Chaos Beast will be revealed... and the most massive Chaos Beast battle EVER will begin! Powerful treasures have been located deep within dungeons scattered across the world. Lore's Legendary Heroes can begin questing for these valuable artifacts that should, the Loremasters say, aid them in the battle against Chaos! 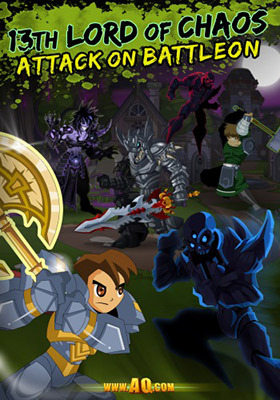 The forces of Chaos collide with the Alliance's Army in the heart of Battleon! Heroes from across the world have converged and are choosing sides to fight for their home and what they believe in... but time is running out! JOIN HISTORY IN THE MAKING! Login and hit the Chaos War button from the town screen. then talk to Maya and choose which side you wish to battle for. The battlefield may change as a battle progresses. Wars are fought by hundreds of thousands of players between one to five days! If you are in the war, you will see two "war meters" at the top of the screen... one for Chaos and one for the Alliance. Whichever side hits 100% first wins that battle. You can increase your side's war meter by defeating enemies and turning in the war medels that you collect. 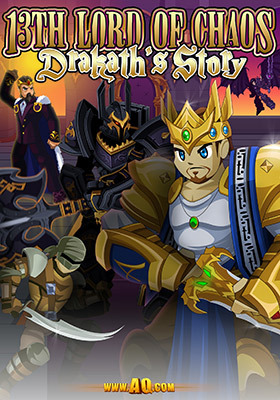 Copyright © 2008-2019 Artix Entertainment, LLC.